Use any Highland micro field - consider adding cones to edge/lines to clearly identify playing area. Every player with soccer ball. Four cones in center creating square. It&apos;s almost Halloween and what does that mean? Candy! Players are on Candy Mountain and have to pick their top four favorite candies. Each side of the playing area (A, B, C, D) is named after one of them e.g. A="Snickers", B="M&M&apos;s" etc. When the coach calls out the name of the candy they have to shout "I need candy!" and run to the correct side. 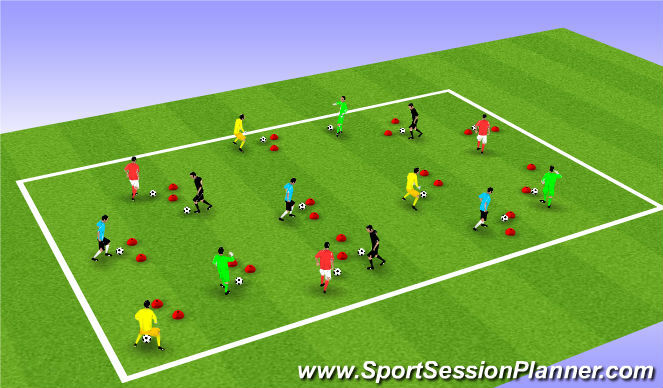 Add candy bag (ball) so players have to dribble to various sides. Try to remember which side of the mountain is which. Keep candy bag/ball close to you. Use big toe, little toe, laces to dribble. P - Players have to run through the kitchen (the cones/square) before getting to the candy. P - Use left foot only. P - Use right foot only. Cones in pairs spread around playing area. Now we have collected all the candy it&apos;s time to get it home as quickly as possible! 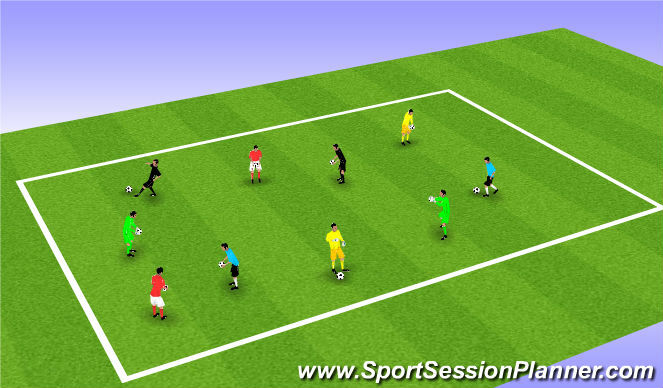 Each player drives/dribbles through the area with their candy bag/ball as coach tells them what color the traffic lights are: Red = stop/freeze, Yellow = dribble/jog, Green = go/sprint. P - Add a trick/skill as you drive/dribble. 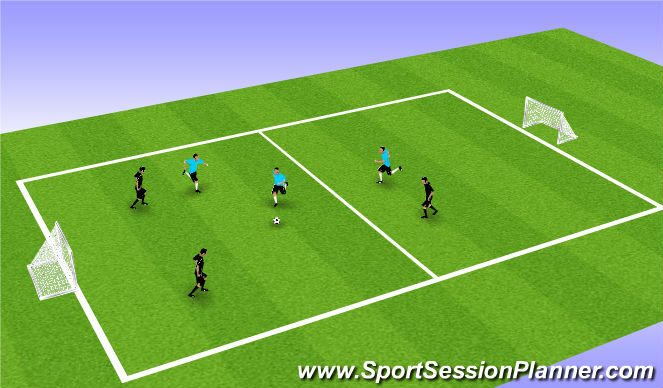 P - Add competition - see who can drive/dribble through the most tunnels/gates in 30/45/60 seconds. Players must shout out the number of tunnels they drive/dribble through as they play. P - Repeat competition - can every player drive through more tunnels than last time? Breakout players - 1 &apos;tagger&apos; per 5 -10 players. Tunnel tag! Players run in the zone until they are tagged - when tagged they have to freeze and stand with their feet apart. To unfreeze a player their team mates have to crawl between their legs. Keep your head up to see where the taggers are. Use changes of speed and direction to get away from the taggers. P - Add ball - to unfreeze player pass the ball between their legs. P/R - Change (increase/decrease) number of taggers.